With so many options, features and finishes, buying a new dishwasher may seem a bit confusing at first. Whether you’re updating your entire kitchen, seeking a sleek, stainless steel model or just ready for a simple upgrade, this guide will help you you choose the right model for your budget and needs. Tip: Carefully measure the space where you intend to install your dishwasher to ensure you buy the correct size. From budget to personal style, several factors go into choosing a new dishwasher, so it’s important to think about what you need. How often do you cook at home? How frequently will you need to run your dishwasher? How large of a capacity will you need? Do you want the quietest dishwasher available? Are you looking for an energy-efficient model? By answering all of these questions, you can narrow down the choices. The three most common dishwasher types are 24-inch built-in, 18-inch built-in and portable dishwashers. What size and load capacity you need will depend on the size of your household. While a one to two person home can opt for a smaller model, a large family would get more overall savings out of a dishwasher with a larger tub for items like pots and pans. 24-inch built-in models are the most common. These dishwashers have unfinished sides and are installed under your countertop. These models also have the most options in terms of style and features. Built-in models are also available in 18-inch compact units, making them ideal for smaller homes and apartments. If you simply don’t have enough room to install a dishwasher under your cabinet, portable dishwashers are a great choice. Easily hooking up to your kitchen faucet, portable dishwashers with wheels can easily be moved in and out of spaces, so they can be stored out of the way. Ideal for those with smaller kitchens or to use in addition to a built-in, countertop dishwashers are versatile and easy to use. Small enough to sit on your countertop, these connect to your kitchen faucet using a quick connect adapter. They also use less water and less detergent than a standard dishwasher. While most standard units are the same size, their capacity will differ. Dishwasher capacity is typically measured in terms of the number of place settings that will comfortably fit inside the unit. A standard built-in dishwasher can usually hold up to 12 place settings with some taller tub models holding up to 16. When choosing your next dishwasher, open up each model and look at the tines. A dishwasher with less space between each tine means you will have more space to load. Wider tines take up more space and don’t allow for large loads. Just as important as size and capacity, your new dishwasher should have a finish and design that matches the rest of your kitchen. When shopping, be mindful of the handle type, control panel and finish that best matches your style. The majority of dishwashers are available in five shades: white, bisque (off-white), black, slate and stainless steel. Some dishwashers do offer a panel-ready design. These are made to match the rest of your kitchen cabinetry, so your dishwasher blends in. Dishwasher handles vary depending on the style. Recessed, pocket and bar handles are the standard choices. For a more modern kitchen, recessed and pocket handles tend to be more popular. Dishwashers have either a front control panel, located on the front of the dishwasher, or a top control panel (also called “fully integrated”), which is located on the inside edge of the dishwasher door. Each option has its own benefits, depending on your needs. 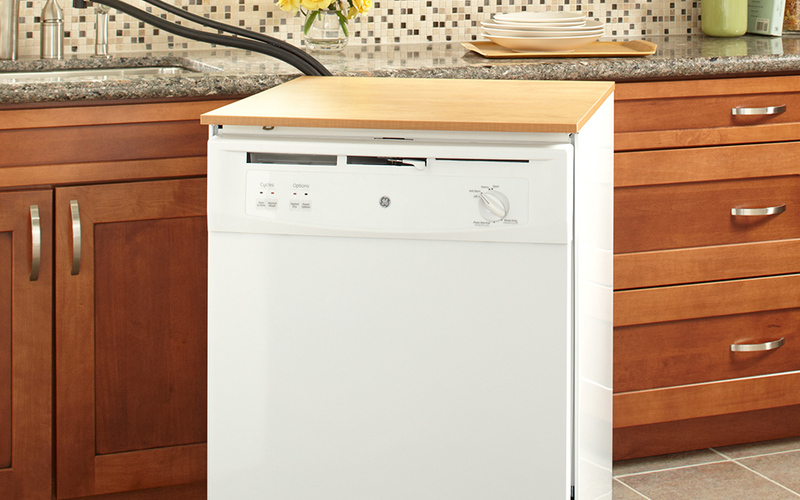 Front control panels make it easy to know which phase of the wash cycle your dishwasher is in. Top control panels are often good for households with small children as they keep the buttons hidden while also providing a sleek look. However, it may not be as easy to tell what cycle your machine is in. Your dishwasher buttons may either be actual buttons or touch control. Tip: When buying a new dishwasher, look for features that will save you money, effort and time. 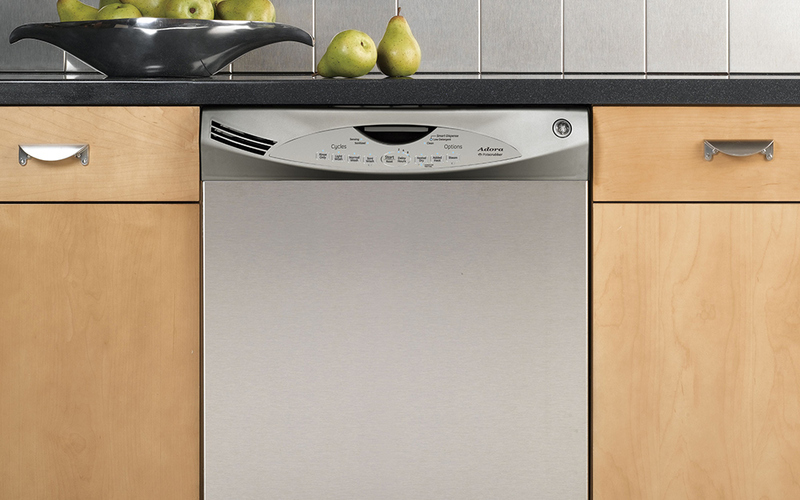 Dishwashers offer more smart features and updated technology now than they have in years past. 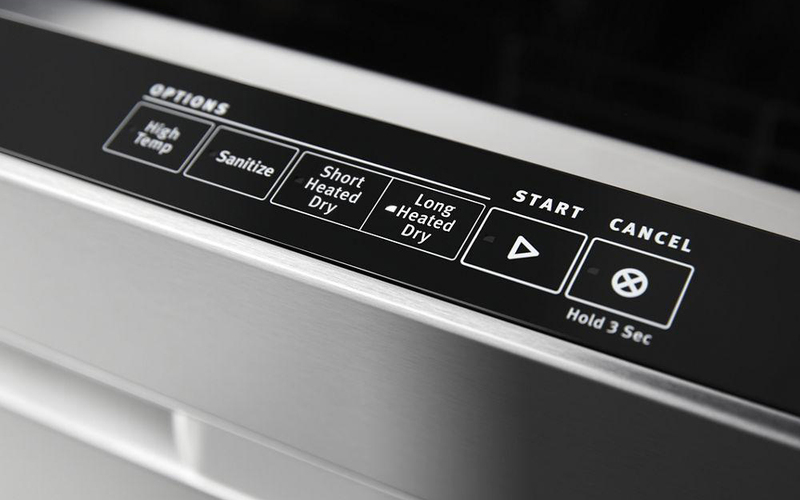 From special cycles to noise level, it’s never been easier to select the dishwasher with the options that matter most to you. Let’s take a look at the most important features to look for when buying a new dishwasher. 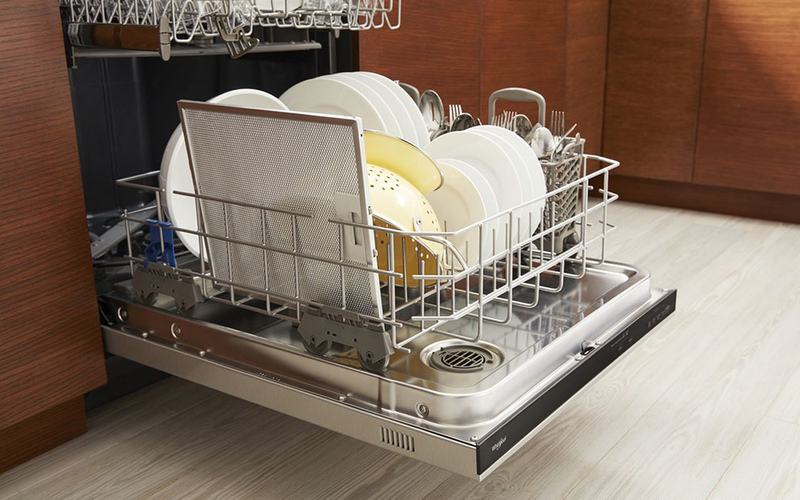 Customize your dishwasher with racks designed to accommodate all your washable items. Third racks offer more space for larger cooking tools and racks with removable or fold-down tines let you configure your dishwasher to fit wine glasses, cookie sheets and more. Sensor technology monitors the soil level and/or temperature of your dishwater to provide just the right amount of cleaning power for efficient operation and thorough results. With advancements in technology, finding the quietest dishwasher is much simpler than it used to be. There are a variety of noise reduction packages available that include quieter motors, soundproof tubs and improved insulation that result in low decibel ranges. The main thing to look for is the dBA rating or the decibel level. The lower the decibel, the quieter the dishwasher. In addition to standard everyday cycles, many dishwashers offer specialty cycles designed to tackle specific tasks. Look for delicate wash cycles for china and other hand-wash items, tough scrubbing cycles for hard-to-clean pots and quick wash cycles to give you clean dishes faster. Basic models will use plastic tubs while more upgraded versions feature stainless steel interiors. While this has no effect on cleaning power, it’s important to note that stainless steel interiors offer lasting, durable performance and better sound dampening than their plastic counterparts. Because of their metal interiors, they reflect heat for more energy-efficient drying and can withstand the high temperatures of sanitizing rinses. Contemporary dishwashers use less energy and water than older models, lowering your utility bills and conserving energy. To improve energy efficiency, look for the ENERGY STAR label. ENERGY STAR dishwashers exceed federal standards for energy use by 25 percent or more. 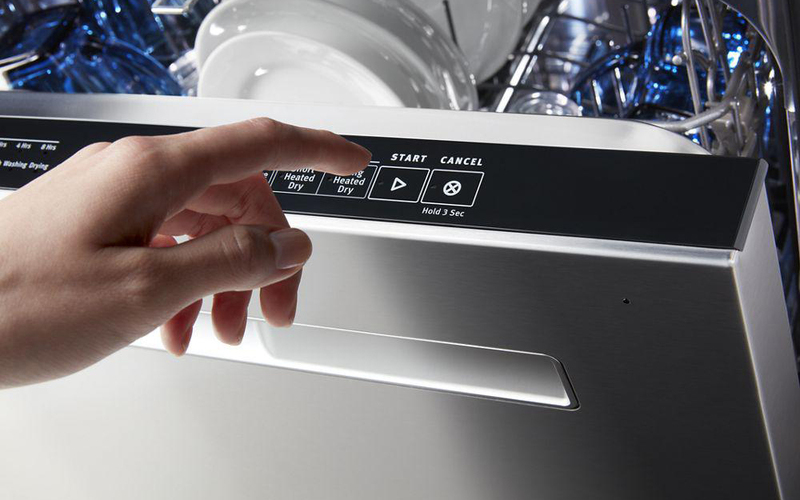 Dishwashers with a delay-start feature allow you to program your dishwasher to run during non-peak hours. Units with features such as sensor technologies and rapid wash cycles offer added efficiency. Dishwashers equipped with an internal heat booster raise water temperatures to the appropriate level, allowing you to keep your hot water heater at a lower temperature for even greater savings that won't sacrifice performance. Some dishwashers will offer extra options such as a hard food disposer, which is meant to help you skip the garbage disposal so you can put the dishes straight into the machine, or a filter which keeps water free from dirty food debris. While these feature are ideal for some households, those seeking a quieter dishwasher will want to think twice about this option as it adds to the noise level.